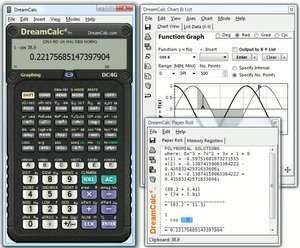 DreamCalc is a fully featured Graphing Calculator for Windows. Unlike the standard Windows calculator, DreamCalc gives you an intuitive and almost tactile experience. It's like using a real hand-held on your PC, laptop or tablet PC! Select from Reverse Polish Notation or two styles of algebraic input, and with the optional ability to run in your system tray--DreamCalc will always be there whenever you reach for a calculator. DreamCalc 5.0.0 is a shareware program and can be used as a demo to try the software until the free trial period has ended. A full version of the program is available after the trial period ends. For security reasons, you should also check out the DreamCalc download at LO4D.com which includes virus and malware tests. Additional screenshots of this application download may be available, too.